By default, the label for the child will include an A as an indicator of an allergy, not the actual allergy itself. The medical / allergy information is on the Roster Report that we encourage you to keep in the classroom. However, if church uses 2-inch labels and you want the entire allergy information to print on the child’s label, instead of the A indicator, follow the directions below. Only a user with Admin role can change the label format. This article refers to labels for those who are members of organizations. All guests will, by default, have a label with the entire allergy printed on it. Highlight the text below and copy it to your clipboard. From the dropdown menu, select Main~200 , and then press Load Label . This will populate the text box with the text you see below, which is the default for those labels. Highlight the text currently in the label text box and delete it. Then paste the text you previously copied. Some people put too much information when asked about allergies / medical information. Before adding the allergies to the Check-In labels, you may want to perform a search using the Condition Medical Length to find anyone with allergy information containing more than about 20 - 30 characters or so. You can go to those records and revise what is in the allergy field. That information is on the person’s Involvement > Registrations tab. 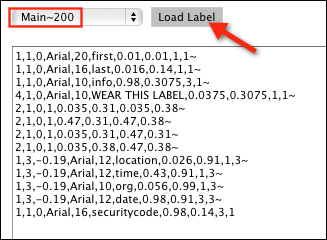 If you ever need to restore labels to the default format, we have a help article which contains the text (codes) you will need for each type of label.